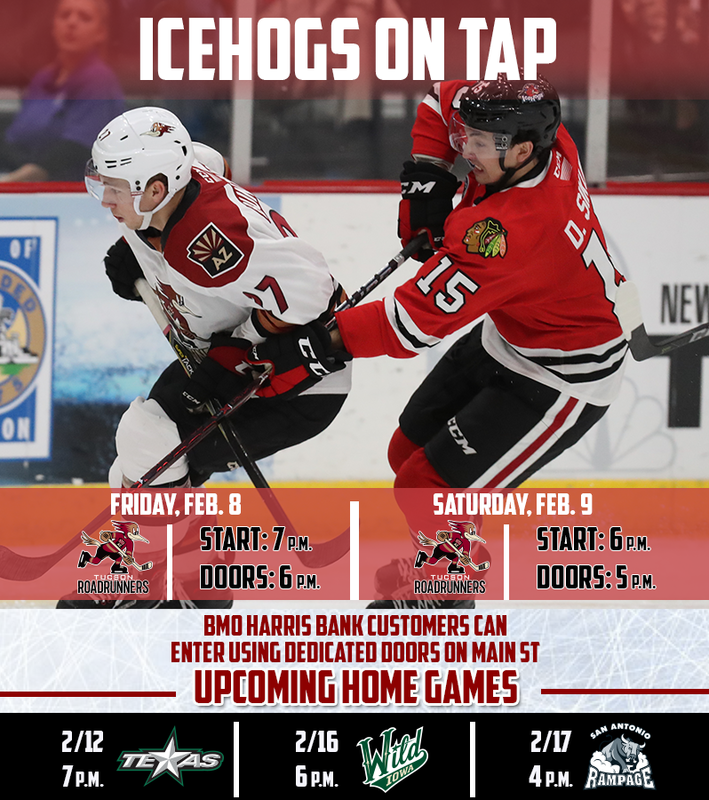 ROCKFORD, Ill. – The Rockford IceHogs hit the heart of their six-game homestand this weekend when they host the Tucson Roadrunners for the first time in team history on Friday and Saturday night. Friday’s promo slate features an IceHogs grill brush giveaway, courtesy of Bud Light, while Saturday is Sock Monkey night presented by Midway Village Museum. However, the sock monkey giveaway that was slated for Saturday has been postponed due to complications with the item’s shipping. Instead of picking up a sock monkey in-person at the game on Saturday, the first 1,000 fans in attendance will now receive a free IceHogs rally towel. When the full shipment of sock monkeys arrives, those fans can simply show their rally towel at the fan zone at a future IceHogs game or at the BMO Box Office to receive their free sock monkey. Time: Puck drop is at 7 p.m. Doors open at 6 p.m. Grill Brush Giveaway: The first 1,000 fans ages 21 and older will receive a free IceHogs grill brush, courtesy of Bud Light. Two-Buck Buds: Each Friday home game during the 2018-19 season features $2 Bud Light beers, courtesy of WXRX. The $2 beers can be purchased at most concession stands on the concourse through the end of second intermission. Blues Flame Friday: Friday home games this season also feature a pregame party in the Blue Flame Lounge, courtesy of District Bar and Grill. Fans can enjoy live music from “Wellstrung” in the Blue Flame Lounge on Feb. 8. Sock Money Night: The IceHogs are teaming up with Midway Village Museum, for Sock Monkey Night. Midway Village Museum, which hosts Sock Monkey Madness on Saturday, March 2, will have an interactive booth at the game on Saturday where fans can participate in arts and crafts and pick up information about the Annual Sock Monkey Festival. There will be a scavenger hunt throughout the BMO Harris Center’s concourse on Saturday where fans will set out to find five fiberglass sock monkeys scattered throughout the arena. Fans who complete the scavenger hunt will receive a prize from Midway Village Museum and the IceHogs. Sock Monkey/Rally Towel Giveaway: Due to complications in shipping, fans will not be able to receive their IceHogs sock monkey during Saturday’s game. The Hogs will treat the first 1,000 fans to a free rally towel Saturday, and those fans can later pick up their IceHogs sock monkey at the fan zone at a future IceHogs home game or the Box Office once the full shipment arrives. No additional purchase is necessary to receive your sock monkey. Pickups can be made during IceHogs home games or at the BMO Box Office during regular business hours. For questions or additional information, please call the IceHogs front office at (815) 986-6465. Hops and Hogs: Saturday’s contest marks the fourth “Hops and Hogs” night of the season. For just $22, fans can purchase this package to receive an upper-end zone ticket and two beer tickets. The beer tickets can be redeemed Saturday at River City, Blue Flame Grill or Goose Island Deck on the BMO Harris Bank Center concourse for a choice of Budweiser or Bud Light beer. Alcohol sales will be available during Saturday's game through the end of the second intermission. Following Saturday’s game, fans will have only one more opportunity to attend a Hops and Hogs game during the 2018-19 season. The IceHogs’ final Hops and Hogs game will be on March 23 (vs. Milwaukee). Fans can purchase a “Hogs & Hops” ticket package in-person at the BMO Harris Bank Center Box Office or by calling the IceHogs front office at (815) 986-6465. Tickets: Tickets can be purchased at the BMO Harris Bank Center Box Office or any Ticketmaster location, by phone (815 968-5222) or online at IceHogs.com. Broadcast: Fans can tune in to all the action on WIFR’s 23.2 Antenna TV or Dish Network Channel 252, beginning with IceHogs Warmup 30 minutes prior to puck drop. IceHogs fans can also listen to the game at sportsfanradio1330.com or Facebook.com/RockfordIceHogs, or watch live at Watchtheahl.com (subscription required). Fans can also follow in-game updates via the IceHogs’ Twitter, @goicehogs. Clear-Bag Policy: The BMO Harris Bank Center will be enforcing its game-day, clear-bag policy. For details on the policy, CLICK HERE.